I guess "The Jerk" was ahead of its time. Why does this make me think of gyro? I think the Greeks are behind this. No - it's the Italians! 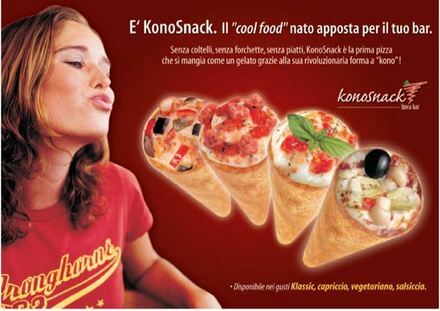 In a world that's always on the move and lacks time - Konopizza is a fast, tasty and, yes, it's true, healthy snack! It's made from the best Italian ingredients, mozzarella, ham, mushroom, tomato, and basil - exactly the same ingredients you'd find on a pizza. It's simply a cone shaped bread base rather than a round flat one. It's cooked for 3 minutes in an conveyer belt oven and is piping hot when served. Invented and developed by Rossano Bosocolo (the guy in the newspaper on the website) in 2003 at the Catering Staff college he operates in Venice, millions have sold across the world. Like any product, we're constantly thinking/reviewing/developing new ways to improve the product and the ingredients. Konopizza is the ideal snack for sports events, fairs, cinemas, shopping malls etc. In Europe, Konopizza in a box is offered to airline passengers on both short and haul flights as a hot snack. Want to try one? I'll arrange for a new page to appear on our website listing all the locations around the world where Konopizza can be found. So, now you know pretty much everything about Konopizza. How wild is that!